It is heartening to see how yoga is spreading widely in the country of its birth and among people of all ages and backgrounds. This mind-body discipline from India which is both an art and science is also much respected and practised in the West. Last Thursday, we witnessed an interesting yoga programme by women at Saptaparni Cultural Centre in Hyderabad. The event was about much more than yoga. It was also about some music, storytelling, past-life therapy, the power of positive thinking, the healing power of letting-go of unhappy memories and other alternative-healing methods. With a female yoga teacher and an all-female students’ batch, it was like a show of women power in yoga. The event also proved that women of any age can take to yoga successfully given that the students were of different age groups—from young mothers to those who were 50-plus. The event was the Yoga Pandits Graduation Ceremony. The students had undergone a 200-hour Foundational Teacher Training Course in Yoga. It was organised by the Hyderabad-based AmrithavarshiniCenter for Holistic Healing and Wellness which had trained these students. The programme was compered by Rajeswari Vaddiparthi, a yoga-teacher and director of Amrithavarshini. The chief guests were renowned past-life therapists Dr Newton Kondaveti and his wife Dr G.V. Lakshmi. The lamp was lit by these chief guests, as well as Anuradha Gunupati, Dr Vivekananda Suri, and musician Lakshmi. Nine female students received their yoga pandit certificates on this occasion and together showcased their learning with Asana Vinyasas in beautifully synchronised moves. They were Dr Rajani Vakkalanka, Karteyeni, Shravanthi Raghu, Haritha, Yukthi, Poorna Chandrika, Meena Tatvarthy, Himabindu, and Ruheenaaz. They first performed to the Guru Paduka Stotram which is a Sanskrit hymn which pays obeisance to one’s guru or spiritual teacher. After this, they demonstrated their Asana Vinyasas to the Suryashtakam which is a paen in Sanskrit to the Sun God. Yoga imparts a suppleness and grace to the body, and both were evident in the students. 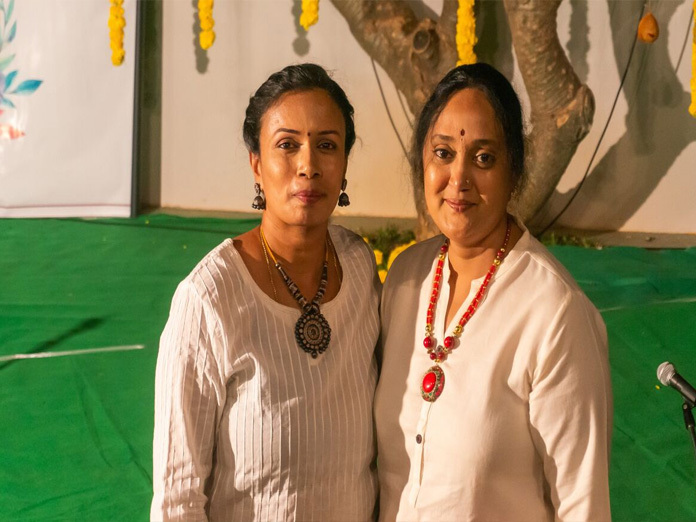 Two of the students, Rajani Vakkalanka and PuvvulaHimabindu spoke on the occasion recounting their life journey and how they gravitated towards yoga and how wonderfully it had transformed their mind and body. Dr Rajani gave an inspiring speech where she described her battles with a variety of serious ailments and traumatic hospitalisations over the decades and how she had learned to triumph over these adversities with willpower and mental strength. Himabindu’s talk was also interesting. Later, Dr Newton Kondaveti and his wife Dr K Lakshmi took to the stage and dwelt briefly on their area of expertise—-past-life regression and spiritual sciences. They said past-life therapy and breath mastery were among the many methods with which they approached their patients. They said it is important for everyone to realise that we create our own reality and must therefore adopt healthy ways of living and thinking. Dr Newton said more and more people around the world are showing interest in alternative therapy systems as they are realising that traditional science may not provide all answers to life’s problems and mysteries. Rajeswari Vaddiparthi added that yoga classes included teaching of allied subjects and thanked the various experts–women in different fields– who had helped groom the students. These included Kamala Anil Prakash (pranayama), Dr Shailaja (Ayurveda), Dr Vaishnavi Jayashree (Anatomy) and Darshana (Diet and Nutrition).